Meet one of our regular volunteers, Zachary! At the young age of 16, Zachary has become not only an asset to the farm, but a part of the Cul2vate family. He came to Cul2vate in July of 2016 because he needed service hours for school. He was put straight to work and not spared tasks because of his age – which he professes he appreciates! 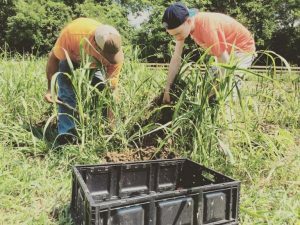 A diligent worker, Zach has become an integral part of the farm and continues to volunteer even after meeting his school requirement. When asked why, he says, “There are a lot of people around the world who need help, and I can’t go to Africa. But I can do something here.” Is it a wonder his giving spirit resonates and why he is such a loved part of the Cul2vate team? Maybe the “swinging harder” post from Sonny? On the blog?